Date: Nov 16 2018, 4 p.m. - 6 p.m.
Don’t miss Right Arm Night Nov. 16 at 4:00 p.m. at Thunder Mountain Activity Center. 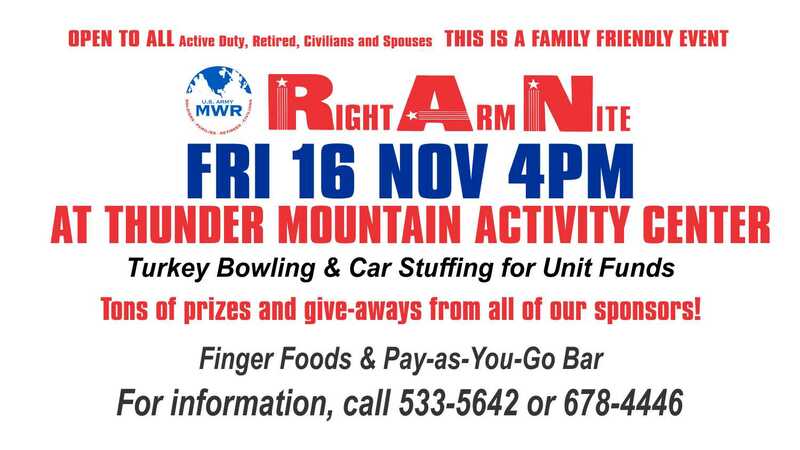 RAN is free and open to Soldiers, civilians, retirees and family members. There will fun games, plus sponsor goodies and prizes, free finger foods and a pay-as-you-go bar. For more information, call 533-5642 or 678-4446.